So what is a Triclops anyway? There are tons of trikes out there, so what distinguishes a Triclops from the rest? It’s a tank, but in the best possible way. It’s built to last you a long time. It’s not the lowest or the lightest. What it is is versatile. When I designed it I made sure it, like all my products, uses as many standard bike parts as possible. Meaning upgrades and repairs are easy and can be done at your local bike shop. Best of all it’s a fun and serious trike that will give you pleasure every time you ride it. 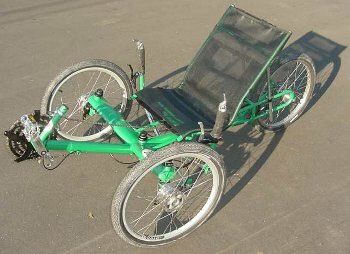 The Triclops is a lowish tadpole trike with 20″ wheels all around. Chain handling is accomplished with one sealed bearing pulley. It sports the comfy Organic Engines Seat and comes standard with Under Seat Steering. The Triclops has disc front brakes standard. In the rear is a pair of linear pull cantilever brakes for sure straight line stopping or wild bootlegger turns. Fit adjustment is huge from a 32” Xseam to a 50” Xseam. This is accomplished with a sliding seat and boom, both of which adjust with Allen head machine screws. The Triclops main frame is constructed from 4130 Cro-Mo Steel Alloy with a 6061 Aluminum seat frame and a seat cover constructed from UV resistant polyester / vinyl mesh with nylon webstraps and Fastex buckles. Finish Powder Coat- Red, Orange, Green, Blue and Black. Custom colors are available for an additional $100. Weighing in at 42lbs, 38″ wheel base and 70″ long over all. The track is 32″ and the width is 34″ seat height is 12″ which varies with the seat angle adjustment. Modified Akerman Center point steering geometry. The Kingpins and Stem use 1″ head sets. We use Colombus steerer tubes and 6061 aluminum connecting rods and high quality 4 piece rod ends. A custom parts gruppo is always an option, the stock Trclops comes with a quality mixed group of road and mountain parts.